Former Environmental Protection Agency Administrator Scott Pruitt answers reporters' questions at the White House. Pruitt resigned his post at EPA on July 5, 2018. 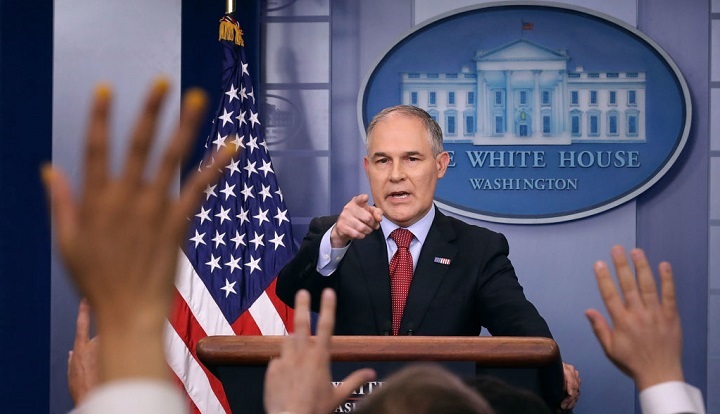 Scott Pruitt’s resignation as the administrator of the Environmental Protection Agency this month comes after extensive reporting from news organizations about myriad ethical scandals that led to multiple investigations and public outrage. Throughout Pruitt’s short tenure at the EPA, MapLight followed his support for the energy industry, cozy ties to campaign donors, and questionable reimbursement requests. Explore the stories below to track MapLight’s news coverage and data analyses of Scott Pruitt at EPA. A timber executive organized a secret Earth Day visit to an elementary school for Scott Pruitt, according to emails and text messages reviewed by MapLight. Oklahoma campaign finance records suggest Scott Pruitt may have been reimbursed twice for items he purchased while serving as the state’s attorney general, experts say. During the last year, Scott Pruitt has met with more than three dozen organizations that donated to his past campaigns and political committees. The donors include major oil and gas companies, electricity providers, coal producers, and conservative think tanks. As an Oklahoma politician, Scott Pruitt received $181,000 in political contributions from donors who lobbied the EPA last year. The donors include lobbyist J. Steven Hart and his wife, who have attracted attention for renting a townhouse to Pruitt -- even as Hart's firm, Williams & Jensen, has lobbied to relax the EPA’s regulation of greenhouse gas regulations. Hart and his wife donated $4,366 to Pruitt’s campaigns for Oklahoma attorney general and his federal leadership PAC. President Donald Trump’s choice to lead the Environmental Protection Agency has received $352,946 in contributions from members of the energy and natural resources sector since 2001. South Carolina's attorney general copy-and-pasted language from an energy lobbyist to get him a meeting with Scott Pruitt. An organization previously led by Scott Pruitt raised more than $750,000 from conservative dark money groups to battle federal regulators.